Brother Shawn and I had the opportunity to get out and chase chukars Friday after Thanksgiving. 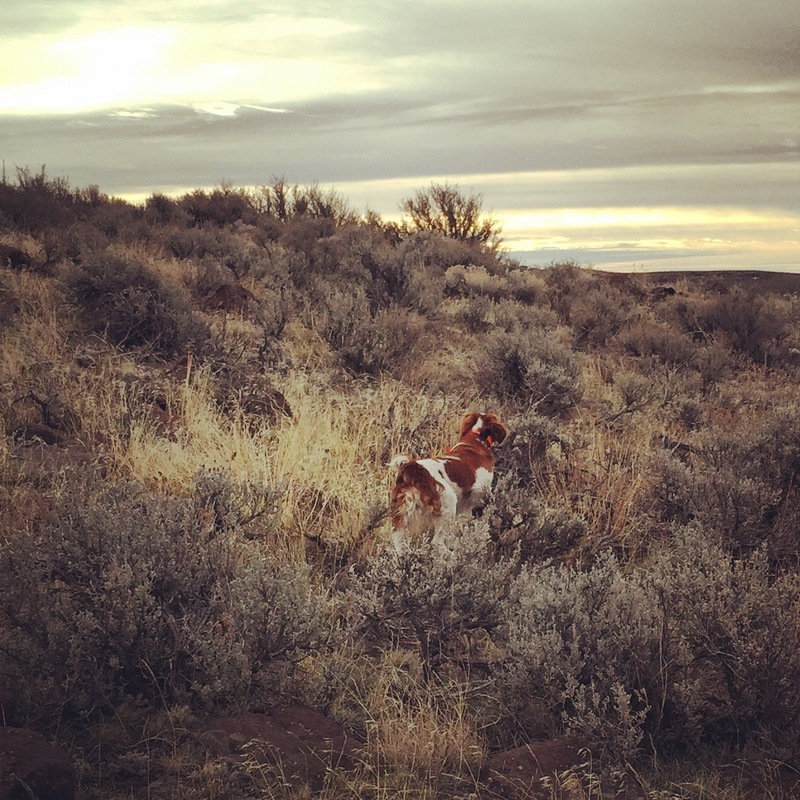 We first hunted chukars on Black Friday nine years ago and we have done this quite a few times since. Shawn hunts Code Brown on Black Friday. 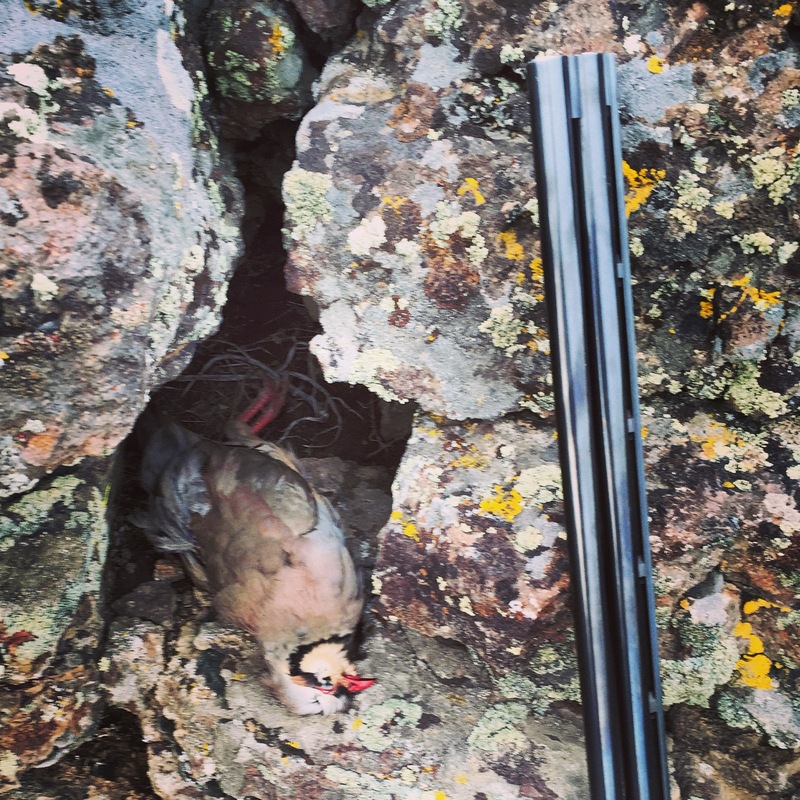 I jokingly call myself “The World’s Worst Chukar Hunter” and also have gone on the record saying that I “hate chukar hunting.” The truth is, I enjoy it, although I feel it is super challenging and oftentimes frustrating. My total number of birds bagged is anything but stellar and I have had some of my worst days of shooting on these difficult birds. Yet, I still go in hopes of creating wonderful memories. Early Friday morning, Shawn and I drove to one of our favorite little diners and had a great breakfast. 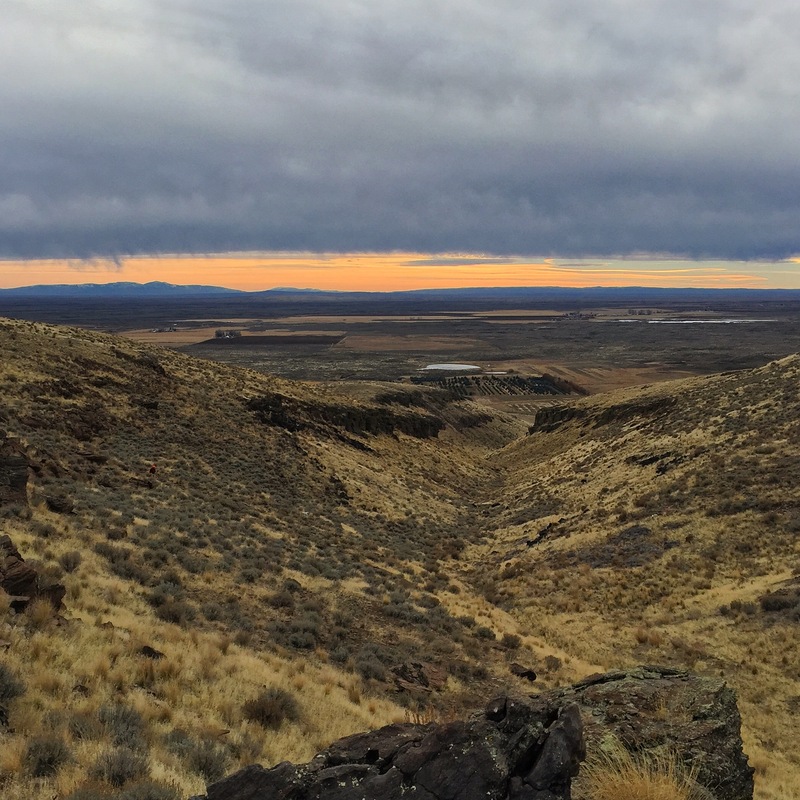 Afterwards, we drove to one of our best coverts to hunt chukars, an area of steep, rimrock crested hills with hints of snow from earlier this month, but mostly gone now. When we arrived the sun was barely rising to the east and cast a beautiful glow over the lunar-like landscape. At my suggestion, we tried to drive up the two track climbing the steep mountainside in hopes of saving our legs for all the forthcoming hiking. However, we did not make it up the steep incline. In fact, when our momentum stopped because of the snow and mud, Shawn’s engine stalled and we began to roll involuntarily back downhill. “Oh no, I don’t like this!” Shawn exclaimed in fear. “Are we going to be okay?” I asked as we slid downhill. “I don’t know!” Shawn replied as he stomped on the brakes. After going about thirty yards down the steep ruts, the brakes finally caught and we stopped. We were both so relieved. We then decided that it was better to park at the bottom and hike up to the top. 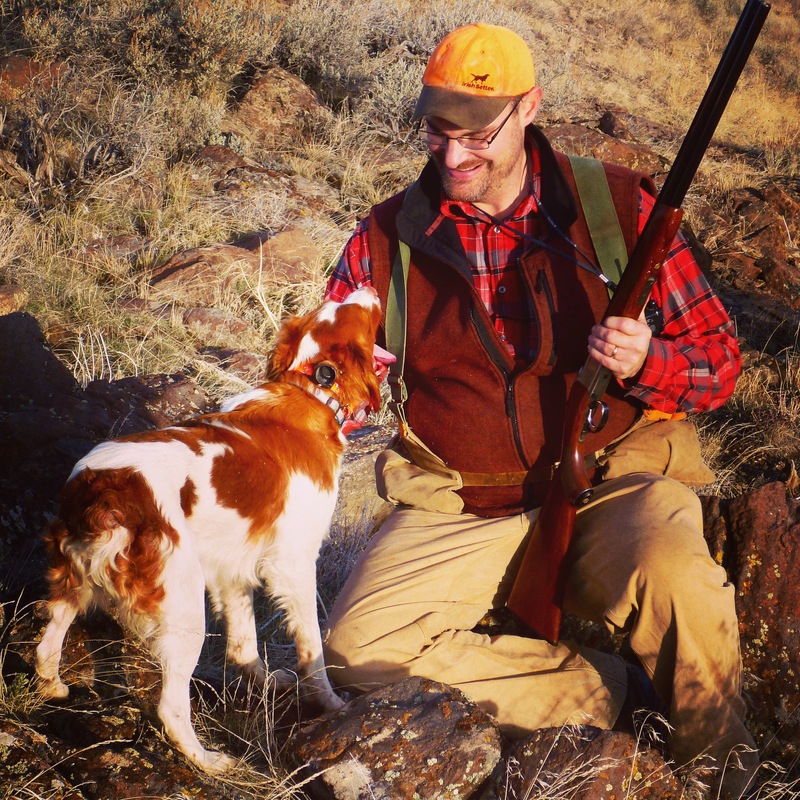 Nothing in chukar hunting is ever easy! Once we parked, we readied for the hunt. Shawn let me borrow his sweet little Ruger Red Label 28 Gauge which we lovingly call “Brandy.” This gun just seems to fit me and it is my favorite gun to shoot. We decided to hunt all of our dogs, which included my Brittany, Misty, Shawn’s Cocker, Ellie, English Setter, Gretchen, and rescue Setter, Danny Boy. We were interested to see if this rescue dog could hunt as he is new to the crew. Shawn and Danny Boy, the rescue Setter. Danny actually did pretty good for his first hunt. We think he has hunted before. When we reached the top, we hunted along the south-facing ridge in search of chukars. We saw tons of sign, but found no birds in the likely looking places. We did see a white snowshoe hare, which stood out like a sore thumb due to the recent melting of snow in this area. We then pushed across the sagebrush covered plateau where we continued to see a bunch of chukar sign. 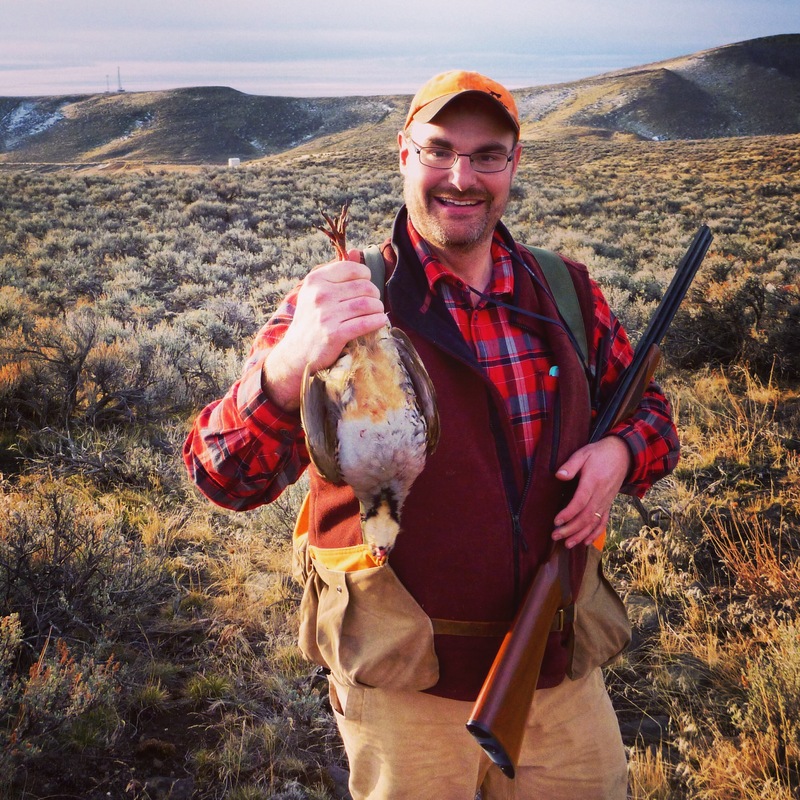 In one area, Shawn saw more concentrated chukar droppings than he had ever seen before for any game bird. My Brittany Misty soon pointed into a shallow sage-filled bowl. “Misty is on point!” I called out to Shawn. As we walked in, she relocated and the bird got up in range. I shot behind it on the first shot. Shawn then shot, missed, and shot again. I watched the bird flinch at Shawn’s second shot as I swung ahead of the quartering bird. At my second shot, the bird finally dropped like a stone. It had been a long time since I had taken a chukar, and this one was over Misty’s point, which made it that much sweeter. Shawn took numerous photos of me and the bird. Thanks for slowing him down for me, Shawn! Shawn and I worked the area over thoroughly and we continued to see chukar sign everywhere, especially in the sage flats up top. We even found more chukars, but they jumped way out of range. Shawn’s dogs eventually found a dead chukar. 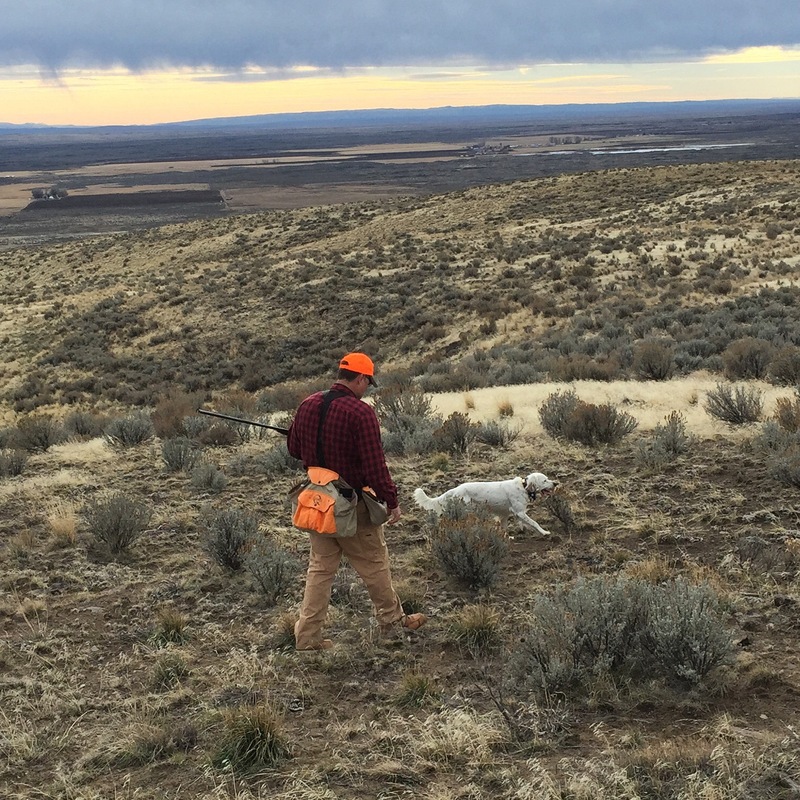 Given the voluminous sign, the birds’ jumpiness, and the dead chukar, we deduced that the area had recently been hunted by other hunters who had busted up the coveys and one had shot and killed a bird without even knowing it. On the north-facing ridge of the same plateau, Gretchen pointed a huge, lone sage grouse which are out of season, but which was still neat to see. 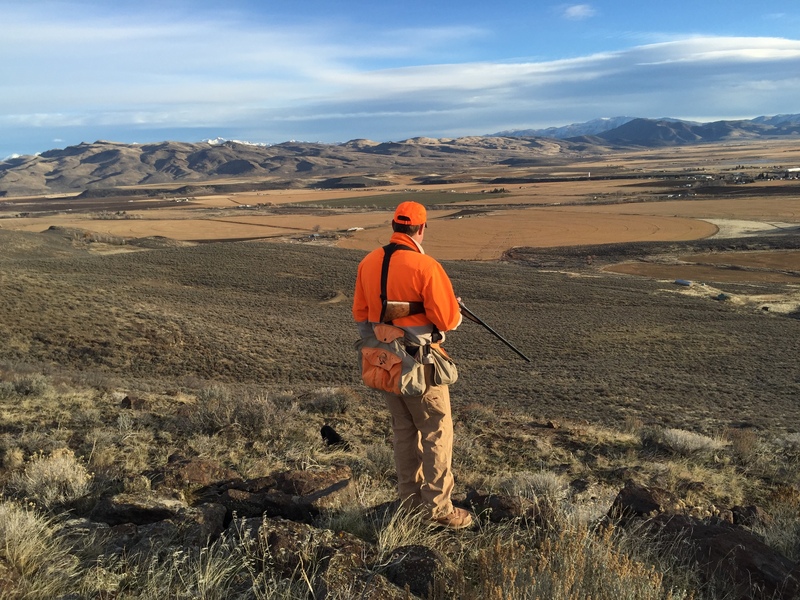 We decided to hunt our way back over to the south facing ridge in hopes of relocating some of the chukar coveys that we had moved earlier. I hiked down the middle of this big draw and saw no birds, while Shawn hunted the outer rim of this bowl and got into three chukars. I heard Shawn shoot once, but later learned he missed the bird as it pitched over a rocky outcropping. All said, Shawn and his dogs found three birds but took none. One came up at his feet, but he did not shoot because he forgot to turn off the safety. Such is chukar hunting! Back at the truck, we ate some candy bars and drank some Gatorade to refuel for one last hunt. We then decided to hunt another nearby rimrock range where we have had great success in the past finding both chukars and Huns. Over ten years ago, Brother Shawn had a banner hunt at this location with our Dad. In fact, Dad had shot a true double on Huns at this spot, which is no easy feat. Some hunt their whole lives and never accomplish it. Needless to say, this spot holds special memories for us, even more so since our Dad passed away last Spring. Dad proudly poses with his double. The hike to the top of the ridge was grueling, but once up top we immediately began to see sign. However, for our efforts, we only found one jumpy covey that flushed out of range. We then decided to hunt down the north-facing slope on our way back to the truck. As I walked down the steep hillside, I thought about our Dad. Of course, I remembered the story of him hunting there and shooting a true double on Huns. Since I wasn’t there at the time, I wondered exactly where this had taken place. The thought crossed my mind that any sign of where this occurred would be totally obliterated by now due to the passing of the years. He then pulled out his camera and showed me a picture of two empty 12 Gauge shotgun shells and explained: “As I was heading back to the truck, I was thinking about Dad and realized that I was close to the very area that he had shot his double ten years ago. I knew generally where it was because I was hunting above him when it happened. 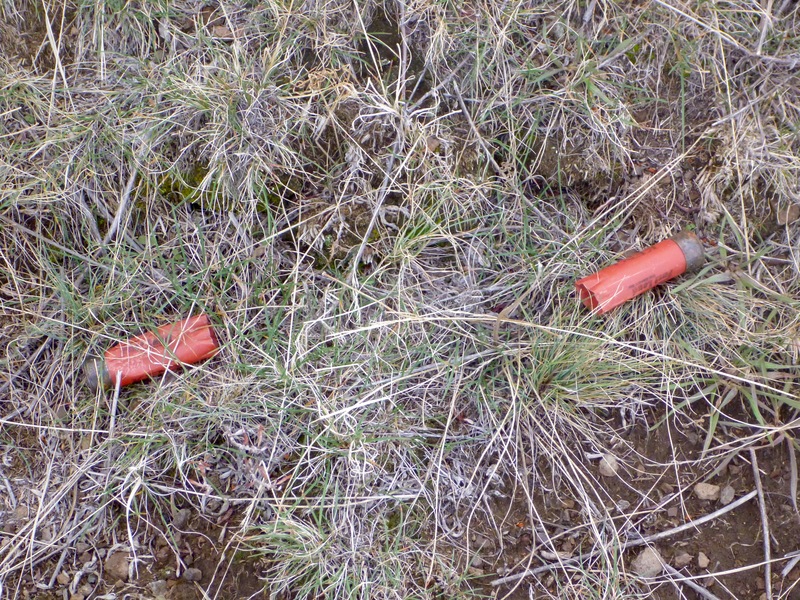 As I thought this, I looked down on the ground and I saw these two shotgun hulls right on the spot. These are Dad’s shells! I just about teared up when I saw them.” Shawn reported. The very 12 gauge hulls from Dad’s double. I was not so restrained as Shawn and immediately shed tears as he told me of this precious find. “That is so cool, Brother. The last person to touch those shells was Dad!” I exclaimed. “This is the first tender mercy I’ve had since Dad passed away.” Shawn testified. “No doubt about that, Brother. Did you grab the shells to take them home?” I asked. “I couldn’t. I wanted this special history of Dad to stay here where it belongs.” He replied. I then understood his reasoning and agreed with his decision. Misty Girl has turned into such a great bird dog and companion. She is a joy to be with in the field. To sum up our hunt, we did not get a ton of shooting in or bag many birds. However, the weather was bluebird beautiful, the dog work was great, and the brotherly camaraderie was second to none. 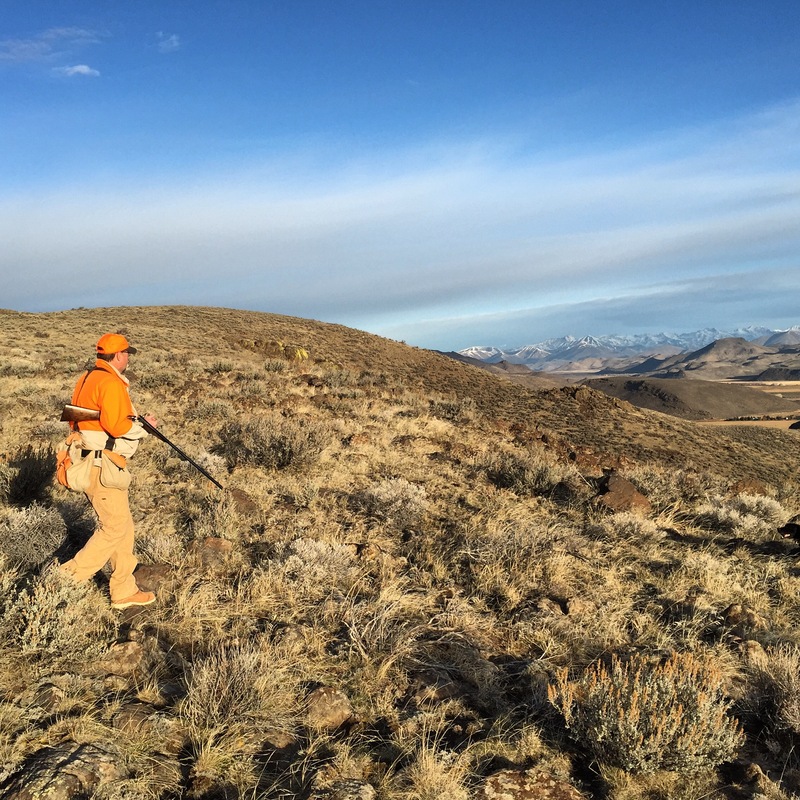 Chukar hunting (or any upland bird hunting for that matter) is so much more than the sum of its parts. It’s all about the adventure, the challenge, the beauty, and oftentimes the memories. Not a bad view from No Man’s Land. Thanks for a true bird hunting experience and a your special remembrance. Thanks Tony. Glad you enjoyed it. Thanks for stopping by. Great Job Andy! Loved the ending! I appreciate that Craig. Funny how these stories seem to write themselves. Hope book sales are going well, my friend. 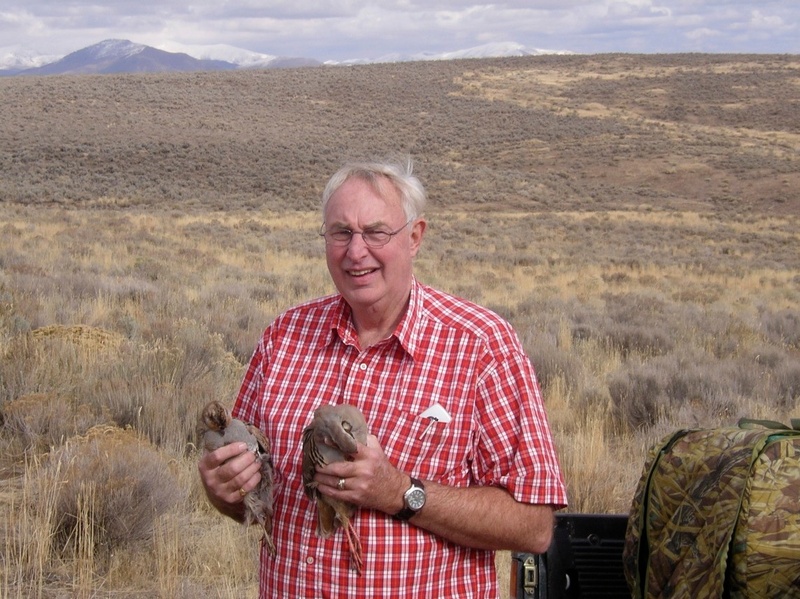 My father taught me to chukar hunt and he can’t go with me anymore due to declining health. The time spent with him in the field is irreplaceable. I found it inspiring to read that you feel the same about the gift of hunting your father gave to you and your brother. Thanks Bill. Our Dad was the best. He taught all of his kids to love the outdoors. We miss him every day, but we have so many great memories to keep us going. Great story about Dad and the dogs. My goal is to get my 68-year-old Dad a chukar this fall. He is just tough enough to get it done. Jay, Good luck to you and your dad on those cantankerous chukars. It’ll be an adventure for sure. Thanks for your comment!